Live Art Magazine Issue 5! 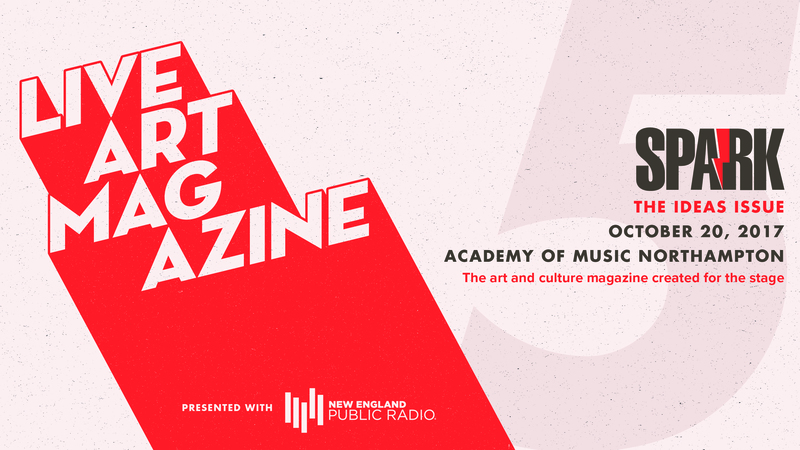 Live Art Magazine is a pop-up performance art event structured like a magazine, with shorts, features, and interstitial delights by local and regional writers, poets, artists, musicians, dancers, filmmakers—risk-takers all. For the fifth straight year, we ‘publish’ their new work and work-in-progress on the stage. The Magazine’s sections include readings (poetry, fiction, essay), performances (music, dance, theater), film, and live radio. We don’t document the evening in a traditional sense (we have a team of illustrators drawing each performance as it happens, but no video or photography is allowed). For artists, Live Art offers a space for them to try new – even risky – collaborations. For guests, it is one time only experience – they won’t be able to find the work anywhere else. To celebrate our five-year milestone, we’re partnering again with New England Public Radio and are joined by local design group The Idea Collective to present SPARK! The Ideas Issue featuring an evening of fresh, innovative, sometimes wacky, and always compelling ideas dreamed up by local creatives including: Whiting Award winner Vietnamese-American poet Ocean Vuong, jazz musician Khalif Neville, radio producer Karen Brown, National Geographic photographer Maria Stenzel, astronomer and cognitive scientist (AKA Mr Universe), Salman Hameed, animator and musician Matt Newman, aerialist Hayley Brown, music historian Steve Waksman – not to mention our house band and audience favorite, the Sci-Tech High School Band from Springfield.